Cancer still represents a major cause of death in the world. In the last decades, a better understanding of the molecular bases of cancer initiation, progression and antitumour immunity response escape has led to the development of new therapeutic strategies. Indeed, targeted treatments against oncogenic proteins and immune-checkpoint inhibitors have considerably improved quality of life and treatment outcomes of patients with cancer. Thus, assessment of predictive biomarker is crucial. According to the US Food and Drug Administration, a companion diagnostic assay, which provides essential information for the safe and effective use of a corresponding drug, is a unique medical device. Conversely, in the European Union the same biomarker can be analysed by using different diagnostic platforms, with different advantages and drawbacks. Nevertheless, any commercially available diagnostic assay needs to achieve validation, for approval by the European Community for in vitro diagnostic use (CE-IVD). Although the next-generation sequencing (NGS) of even whole exomes or genomes is today feasible in expert centres, currently only limited pieces of genomic information are clinically relevant for the therapeutic management of patients with advanced cancers. Indeed, besides clinical trials and experimental protocols, the list of predictive actionable genomic biomarkers is quite short to date. Relevant examples include in colorectal cancer mutations of KRAS and NRAS; in lung cancer, mutations of EGFR and rearrangements of ALK and ROS1; and in melanoma BRAF and NRAS mutations.1–8 Reflecting the requirements of expensive equipments, experience and skilled personnel, these mutational assays are often centralised in reference laboratories. The longer interval of time between test prescription and result delivery may delay the treatment of patients with advanced cancers, some of them suffering from acute deterioration and needing rapid therapeutic decisions. The Idylla system (Biocartis, Mechelen, Belgium) can be easily implemented in pathology laboratories to diagnose quickly and simply oncogenic mutations.9–26 This methodology consists of a cartridge-based fully automated medical device able to perform molecular analyses in <1 day even in laboratory without experience in molecular analyses. Briefly, formalin-fixed and paraffin embedded (FFPE) tissue sections or even cytological material are placed in a single-use cartridge, itself placed in the Idylla platform and the whole real-time quantitative PCR procedure is performed automatically inside the cartridge, from the DNA extraction to the assay interpretation. In the last few years, a large body of data has accumulated on the various facets of this innovative technology. Hence, it seems the time is now ripe to review the technical and clinical aspects of the Idylla system as an alternative or a complementary molecular diagnostic tool in oncology applications discussing its advantages and limitations in the management of patients with advanced cancers. The MEDLINE and Google Scholar databases were searched to retrieve studies addressing the Idylla system performance compared with other diagnostic methods. Only original papers were taken into account, excluding congress abstracts. Data analysed included the number and the types of samples, the specific Idylla cartridges employed and the non-Idylla reference method; special care was also taken to record any case showing discordance, focusing on the underlining reasons leading to Idylla and non-Idylla methods disagreements. As shown in table 1, 18 original studies evaluated the performances of the Idylla system compared with other methods.9–26 These latter widely differed among studies, and in some instances, besides a first-line reference method an additional third method was used to further analyse discrepant results. Overall, five studies were dedicated to colorectal cancer, four to lung cancer, four to melanoma, one to thyroid cancer, one to pancreatic cancer and three to different tumours including the aforementioned types as well as a few examples of other tumours. FFPE tumour samples were analysed in 15 studies, including one report analysing both tissue microarray core biopsies and matched whole tissue sections. In three additional studies, non formalin-fixed cytological material was used. 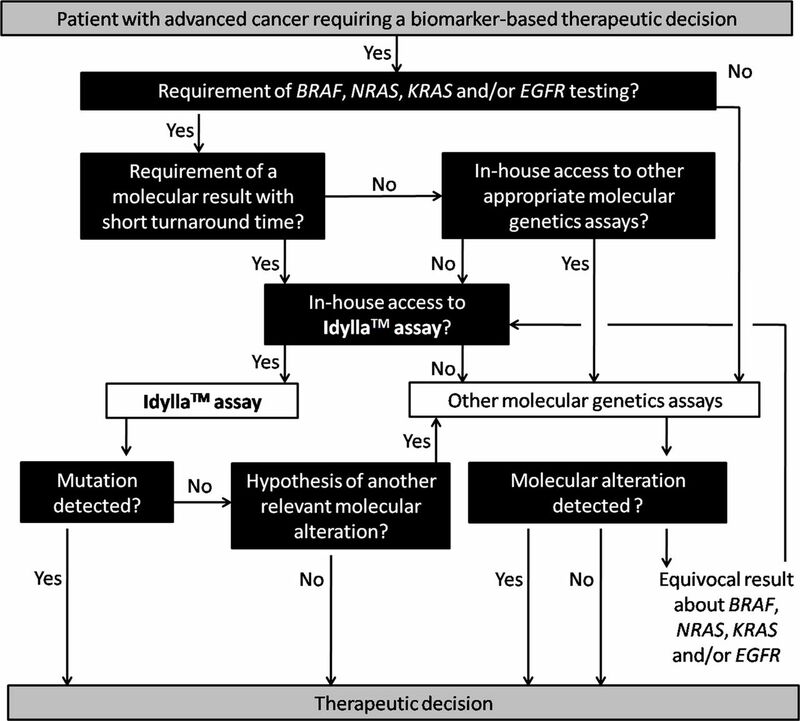 BRAF was the only mutational test assessed in seven studies, whereas its association with NRAS or with NRAS and KRAS testing was evaluated in two and one studies, respectively. KRAS assay was studied as the sole diagnostic test in four studies and in association with EGFR testing in the other two studies. In one of these, a sequential strategy was based on patient smoking history as EGFR and KRAS were tested first in non-smokers and smokers, respectively.10 Two studies only analysed EGFR mutational testing. Considering all 18 studies, a total of 2482 Idylla tests were performed in tumour samples obtained from 2343 patients. Idylla methodology did not yield contributive results in 1.9% (48/2482) of the cases, which was a less frequent occurrence when considering the reference methods (3.1%; 76/2482). Overall, in 2378 instances Idylla and reference method paired results were available for comparison, with a concordance rate of 94.8% (2255/2378). Discrepancies were obtained in 123 instances (5.2%). Most (84.6%) of these cases (104/123) were further resolved by a third method. The Idylla result was confirmed in 54.8% (57/104), whereas discrepancies were still observed in 46.2% (47/104) of cases. Detailed data per gene are provided hereafter and illustrated in figure 1. Graphical summary of the results using different Idylla tests compared with other molecular methods. Three different types of Idylla cartridges were used for BRAF analysis.9 16–18 20–23 25 26 The Idylla BRAF Mutation Test (CE-IVD approved) was used in seven studies whereas the Idylla NRAS-BRAF-EGFRS492R Mutation Assay (research use only) and the Idylla NRAS-BRAF Mutation Test (CE-IVD approved) were each used in one study. Overall, the rate of non-contributive results with these cartridges was 1.8% (25/1402). The concordance rates with the reference methods of the three cartridges were respectively 95.5% (1031/1079), 100% (53/53) and 100% (242/242); thus, discrepant results were only reported when using the Idylla BRAF cartridge (4.4%; 48/1079). Considering these cases, a BRAF mutation was detected solely by Idylla in 70.8% (34/48) of instances, whereas a BRAF mutation was detected by the reference method but not by Idylla in 22.9% (11/48) of discrepant cases. Different BRAF mutations were instead detected by the two methods in 6.3% (3/48) of discrepant cases. 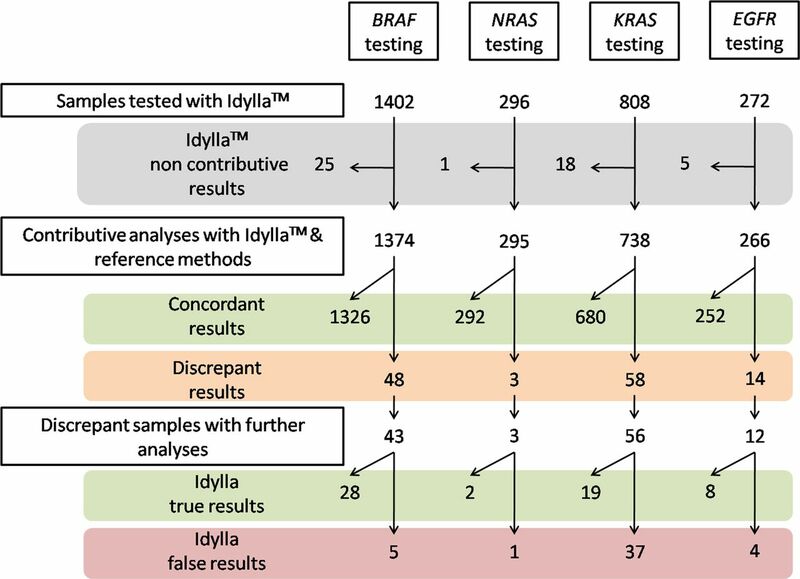 Extremely rare BRAF mutations not included in the reference range (see table 2 for the list of mutations of the different Idylla cartridges) were responsible of Idylla-negative results in three cases. Sample cross-contamination, occurring during the preanalytical tissue handling, caused an Idylla false-positive result in one case. Third-line analyses allowed to confirm Idylla results in 58.3% (28/48) of discrepant results. In 31.3% (15/48) of cases, no further explanation was given to explain the discrepancies. Although the CE-IVD-approved Idylla EGFR Mutation Test has recently become available, literature data are based on four studies, carried out by the RUO Idylla EGFR Mutation Assay.10 13 15 19 On a total of 272 tests performed with this cartridge type, only 5 tests (1.8%) were non-contributive. Considering the data relative to the comparison of the 266 Idylla to the reference method, 14 (5.3%) cases showing discrepancy in EGFR mutational status were reported. Thus, the concordance between Idylla and the first-line comparison method was 94.7% (252/266). In four cases, Idylla detected EGFR mutations that had been missed by the first-line comparison methods (fragment length and TaqMan assays) and, for two of these cases, a subsequent NGS analysis confirmed the mutations detected by Idylla. In one case, an Idylla software misinterpretation led to the erroneous detection of a EGFR exon 20 insertion besides two G719X and S768I mutations whereas only the G719X and S768I mutations were detected by NGS in this case. Idylla also detected a L861Q mutation in one case and T790M mutations in two cases, whereas pyrosequencing failed to detect these mutations (a third method confirmed Idylla results in these three cases). Nevertheless, in three samples, low allelic frequency EGFR T790M (NGS data) were not detected by Idylla. The timely delivery of a biomarker testing result is a very crucial requirement to guide the therapeutic management of patients with advanced cancers, especially in case of acute deterioration. Beyond their expertise in tumour histopathology, as a matter of fact pathologists supervise the analytical workflow of immunohistochemical (IHC) and fluorescent in situ hybridisation assays, rendering accurate microscopic interpretation of relevant predictive expression, such as ALK, ROS1 and PD-L1. Conversely, molecular genetics mutational analyses often are not performed in surgical pathology laboratories but outsourced in reference molecular biology laboratories, which do not always hire a staff pathologist to take care of the crucial preanalytical steps related to microdissection for tumour cell enrichment. Ideally, novel technological advances could be instrumental for pathologists to perform molecular genetics analyses in-house at the time of the histopathological diagnosis, thus reducing testing turnaround time and allowing rapid treatment choices for the patients. The Idylla device is a fully automated medical device able to perform molecular analyses in a few hours (between about 1 to 3 hours). To date, Idylla cartridges are available as CE-IVD-certified tools to analyse the most established actionable biomarkers. Indeed, using Idylla cartridges, it is feasible to test for EGFR and KRAS mutations in lung cancer samples, as well as KRAS, NRAS and BRAF mutations in colorectal carcinoma samples or BRAF and NRAS mutations in melanoma samples with an excellent concordance with other classically used molecular methods. The implementation and use of Idylla does not require neither staff that has especially been trained in molecular analyses nor dedicated laboratory rooms, representing a sustainable method for pathology laboratories, even without experience in molecular pathology. Data generated by the studies listed in our review demonstrate high accuracy of the Idylla system to test for BRAF, NRAS, KRAS and EGFR mutations in different cancers, underlining the cost-effectiveness of this approach with respect to other molecular methods.27 Local issues require local solution and depending on laboratory expertise and resources, Idylla can both represent a stand-alone diagnostic device or it can be included in a more complex diagnostic algorithm. The Idylla cartridges are designed to detect a wide range of mutations occurring in given oncogenes; thus the technique is highly accurate to detect more frequent mutations, whereas very rare and/or complex genomic variants, which are not included in the reference ranges, cannot be detected by the Idylla system. Hence, the occurrence of rare false-negative results should be taken into account as inevitable instances, when this system is used in a stand-alone manner. However, it is should be borne in mind that limitations do not apply to the Idylla system only as it is widely held that none of the molecular methods currently used in this field has perfect performances. The data reviewed in this study showed that in most of the discordant cases a third method confirmed the original assessment by Idylla. Being easy to use and rapid, the Idylla molecular method can be performed to reduce turnaround time as a first-line diagnostic tool, while a more comprehensive NGS analysis can be carried out a second time. Alternatively, Idylla can be used as an orthogonal technique to confirm, in a short time, uncertain results generated by the first-line use of a laboratory-developed technique (see figure 2). Proposal of a decision algorithm incorporating the Idylla assay with other molecular assays in laboratories practising molecular pathology. To conclude, the Idylla system is a valuable, fast and easy-to-use diagnostic platform for molecular genotyping. In addition to the currently available tests dedicated to BRAF, NRAS, KRAS and EGFR genotyping, new cartridges are being developed. The Idylla system testing for new biomarkers required for the therapeutic managements of patients (eg, microsatellite instability) will increase the capacity of pathologists to deliver quickly molecular information relevant to immediate treatment choices at the time of diagnosis.30 This first-line quick molecular diagnosis will not impair further more extensive but also more time-consuming genotyping for subsequent patients' management. Coupling with morphological IHC and in situ hybridisation analyses, pathologists have now with Idylla the opportunity to deliver a molecular diagnosis in one single day for the early management of patients with advanced cancers who are candidates for targeted therapies. We reviewed 18 studies evaluating the Idylla diagnostic platform. BRAF, KRAS, NRAS and EGFR analyses were considered. The concordance between Idylla and reference methods was excellent. Idylla permits a fast molecular diagnosis in 1 day for patients with advanced cancers.
. NCCN guidelines insights breast cancer, version 1.2016. J Natl Compr Canc Netw 2015;13:1475–85. Contributors Both AU and GT collected the data, drafted the manuscript and approved its final version.